The likes of Valve Anti-cheat, Punkbuster, and ESL Wire are all well and good when it comes to detecting cheaters in multiplayer games, but what happens when a cheat bot manages to outsmart the software? What you need is a hardware solution. A what now? 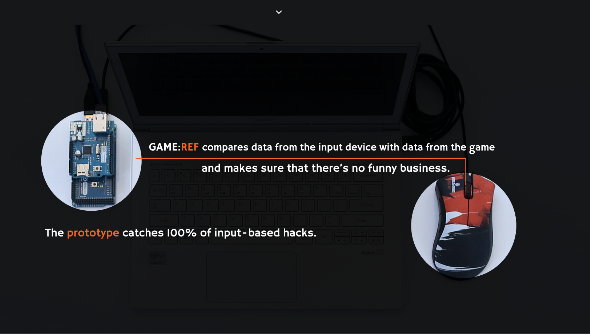 Game:ref is the name of a new prototype that uses a piece of hardware connected to your PC to detect cheats, rather than relying on a piece of software that could be tricked. Essentially what the Game:ref does is compare incoming data from your mouse with the data of what’s going on in the game. If this doesn’t match up, then it knows it’s got a cheater on its hands. The prototype catches 100% of input-based hacks, according to the Game:ref website. So what use is it? Immediately you may think it’s pointless: who’s going to buy one if they know they’re not going to cheat? But think about tournaments: if every player attending an event was given a Game:ref and its use was mandatory, the results could be great. The design is built on an open-source platform, with the idea of making collaboration with developers easy. The project will be coming to Kickstarter soon, with the hope of raising enough money to become a real product. Do you think this could be the real solution to cheaters?